Once, the coach even screamed, “Cole, where are you?? !” when Cole was behind him on the bench. No wonder he hadn’t been in position, right? At first, I was mildly concerned about this. Cole’s the type of kid who always wants to please his teachers and coaches, and I was worried that the double dose of negative feedback might discourage him. But then I started to notice the little smirk Cole always had when he would recount the number of times the coach had yelled at him during a game. So, why was my son fine with getting screamed at? First, from the way his coach joked around with the kids after games (well, at least games they won), it was obvious that he liked all the kids, including Cole. But there was something else: Nobody wants to be the player who never hears from the coach. 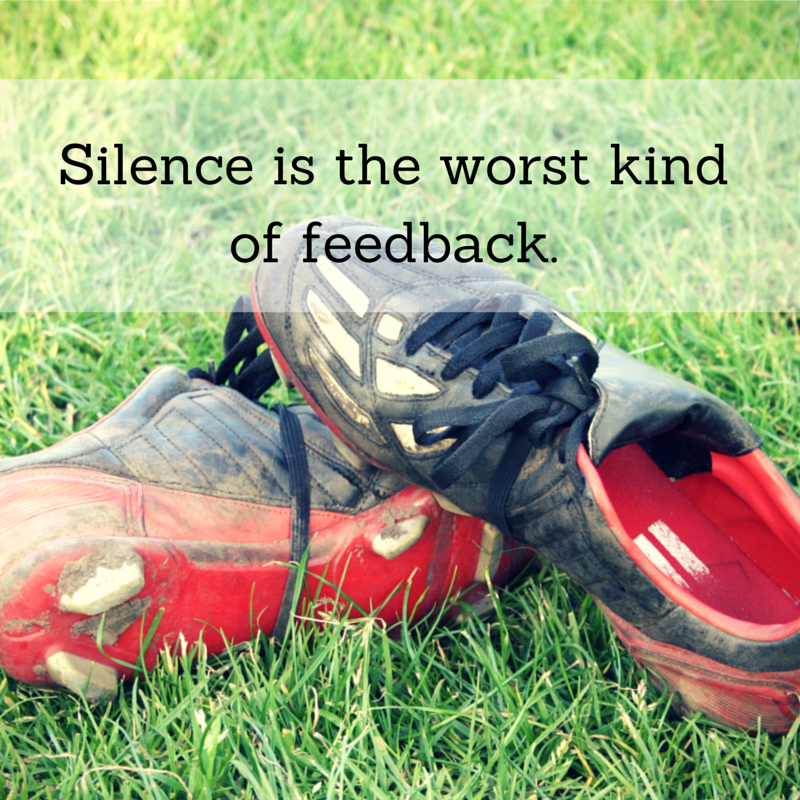 Silence is the worst kind of feedback. If the coach is yelling your name, it’s because he sees potential in you. He thinks you can make a difference out there! Just like on a sports field, our kids wonder what we think of them, from over there on the sideline of their lives. They crave our input. And from their perspective, silence is the worst kind of feedback at all. It means we don’t even see them. We don’t see any potential, worth speaking of. We don’t think they can make a difference. From the time they are little, our kids learn to see themselves the way we–their parents–see them. I wrote earlier, based on my own experience, how words shape who we become. Words matter. Our words to our kids matter. They long to know what we see in them. What they ultimately crave is our blessing–the blessing only we can give. We should bless our kids with carefully chosen, encouraging words. We should tell each one why we are thankful for them, as unique individuals. We should say it out loud. We should look into their eyes and smile. We should give them our blessing! Nobody wants to be the kid with a parent on the sidelines who says nothing. I would have been alarmed if she'd been in tears, but she was proud. It showed progress! She was improving! She recognized that she didn't NEED to be yelled at (instructively) as many times and that was AWESOME! I'm glad you mentioned that our words of encouragement should be carefully chosen because flattery is almost worse than silence in some ways. So thankful for Tiny Paragraphs and your great perspectives shared! Happy Thanksgiving, Mary!! I'm thankful for YOU. So true about flattery. I remember hearing about a girl, who in college, was so surprised to learn that she was just 'average'. She had always been told otherwise, and it was such a letdown. May I never give my kids cause for letdown or for intimidation when they face the world.